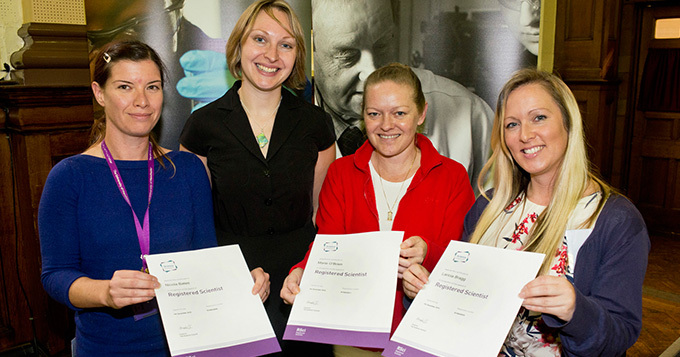 The University of Manchester is the latest Russell Group university to become a Science Council Employer Champion. At an event held last month Jonathan Winter, Head of Staff Learning and Development was presented with their Employer Champion plaque, while the first four members of staff to become registered were given their certificates. Nearly 200 of the university’s technical staff were gathered to celebrate the launch of a new cross-faculty technical networking group, Technical Excellence at Manchester (TEaM). Presentations were given by Jonathan Winter, Hannah Kowszun, Dr Carol Yates, who spoke about the evolving status of the technical career within science research and academia, and two members of the TEaM steering group who reported on survey results concerning the challenges technical staff face across the University. Lisa Grady, one of the TEaM steering group, said, “The steering group were thrilled to see so many staff really engage with the group’s purpose and look forward to seeing that enthusiasm at our next events in the New Year”. Photo: Nicola Bates, Laricia Bragg and Marie O’Brien with their registration certificates, with Hannah Kowszun, Director of Marketing and Communications.